With views of the Dubai Fountain and Burj lake, Thiptara is one of the most romantic places to spend Valentine’s Day in the city this year. Aside from an exclusive 4-course menu, their Valentine’s package includes a single rose and heart shaped chocolate gift for the ladies, a souvenir Valentine’s Day card with a photo of the couple and those who reserve in advance will receive a romantic table set up, all for AED 750 per person. During February Rak’s award-winning steakhouse is offering up a delicious Valentine’s set menu. Diners can expect foie gras crumble, scallop and lobster and fix river strip loin with red grape sauce. There will be a choice of two menus offer – 4 or 7 courses each with grape pairing. Prices start from AED 350 and will be available throughout the Valentine’s period. To book call Waldorf Astoria Ras Al Khaimah on +971 7 203 5555 or email rasalkhaimah.info@waldorfastoria.com, for more information visit Lexington Grill. Take a romantic trip to South America with Frevo this Valentine’s Day. The restaurant is offering a Valentine’s menu and special limited drinks created by their in-house mixologists to celebrate the day. There will also be a live guitarist and of course- plenty of roses. Unable to celebrate Valentine’s on the 14th of February? No problem – the romantic Argentinean restaurant Asado has you covered. Throughout the month of February the restaurant will be offering diners a specially crafted Valentine’s menu, and a live band playing Argentinian love songs. 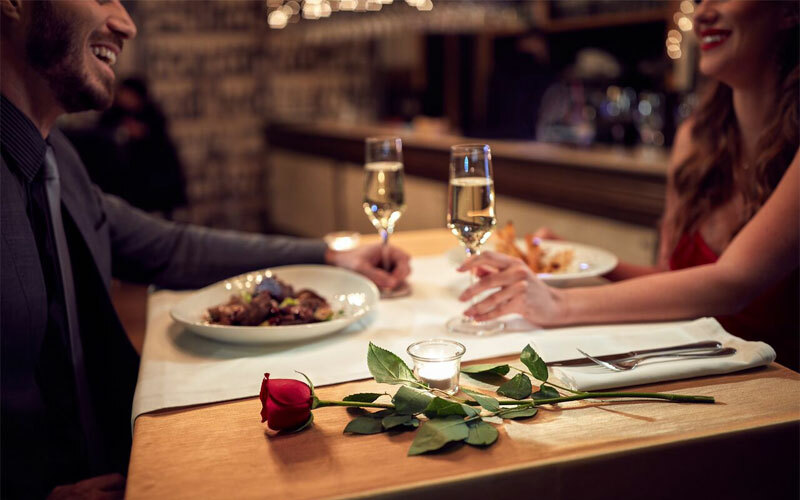 If you’re looking for something extra-special to spoil your loved one with this Valentine’s Day, you can’t go wrong with a table at award-winning French restaurant Traiteur. Take advantage of the cooler weather and book a table outside, with incredible views of the Dubai Creek and Downtown skyline. Their Valentine’s deal includes a 5-course set menu paired with French bubbly. Packages start from AED 950 per couple. For more information visit Traiteur. To book a table online email Dxbph-restaurantreservations@hyatt.com or visit Park Hyatt restaurants.